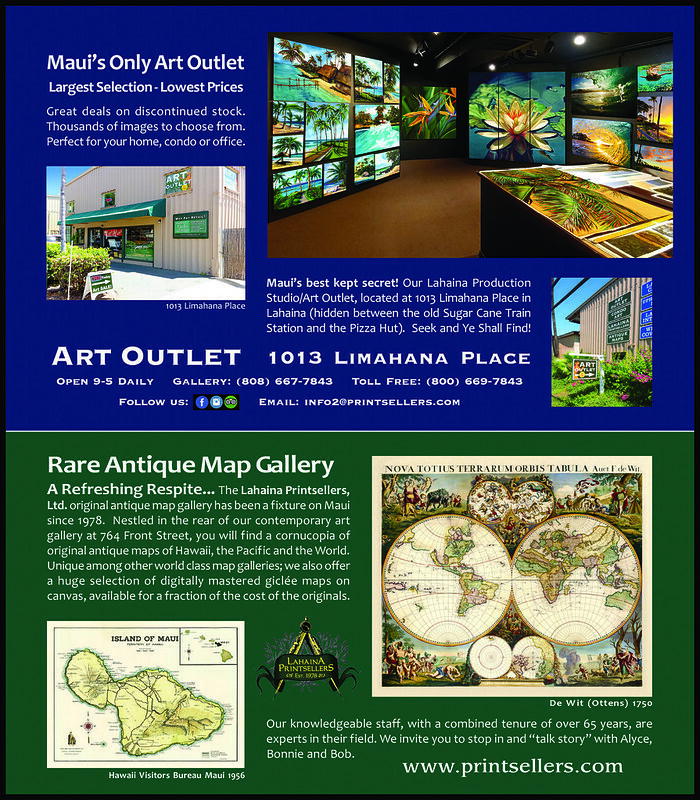 A welcome splash of vibrant and colorful local art awaits at Lahaina Printsellers, Ltd., where a cornucopia of tropical island images delights every taste. Pioneers in digital printing on canvas and dye infused aluminum, their art is both affordable and durable. They print on premium canvas with HP Vivera inks, which are guaranteed not to fade or shift for 100 years! 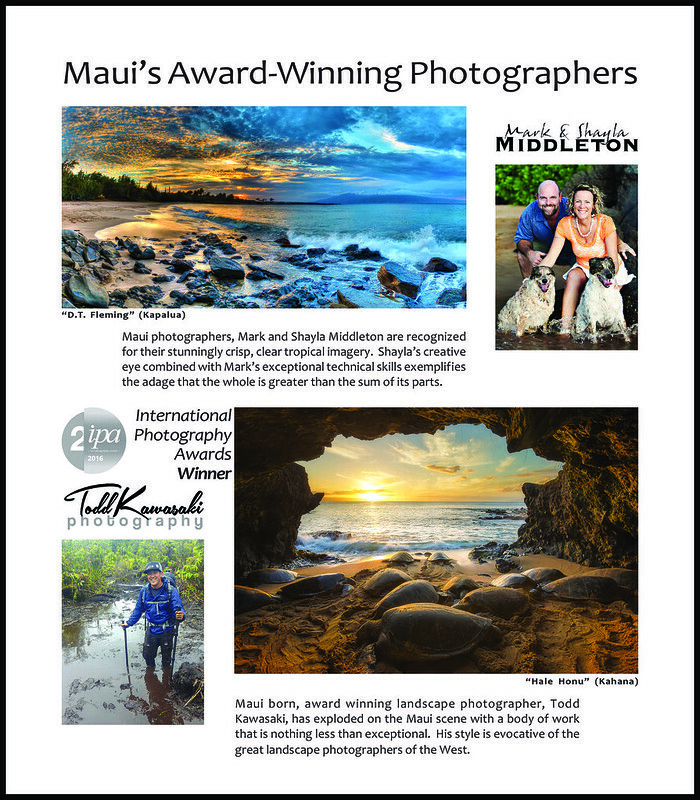 Besides their world class photographers, Mark and Shayla Middleton and Todd Kawasaki, the gallery is the exclusive North American representative of the works of New Zealand artist Simon Williams, whose oil paintings are featured on the three section covers of this magazine. 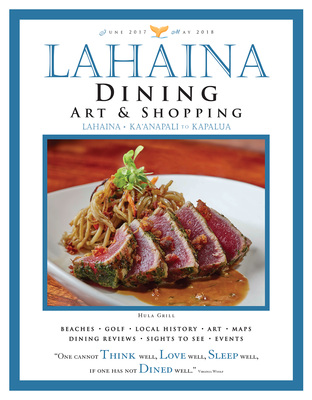 Lahaina Dining • Art • Shopping Magazine offers a complete array of fabulous restaurants, world-class art, Hawaiian lu‘au’s, and unique shops from Lahaina to Ka‘anapali to Kapalua. West Maui is blessed with an abundance of sandy beaches, lovely resorts and condominiums, plus prized golf and tennis courses. The quaint town of Lahaina is steeped with history: from early Hawaiian, missionary, whaling, plantation days, to the present. With informative articles, reviews, maps, and event calendars, this magazine is all you need to start exploring this popular destination.